Seattle, Wash. – Planetary Resources PR – April 24, 2012 – Planetary Resources, Inc. announced today its plan to mine Near-Earth Asteroids (NEAs) for raw materials, ranging from water to precious metals. 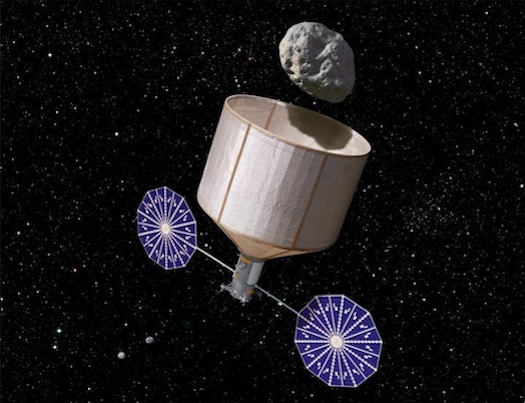 Through the development of cost-effective exploration technologies, the company is poised to initiate prospecting missions targeting resource-rich asteroids that are easily accessible. Resource extraction from asteroids will deliver multiple benefits to humanity and grow to be valued at tens of billions of dollars annually. The effort will tap into the high concentration of precious metals found on asteroids and provide a sustainable supply to the ever-growing population on Earth. A single 500-meter platinum-rich asteroid contains the equivalent of all the Platinum Group Metals mined in history. A new study sponsored by the Keck Institute for Space Studies (KISS) has concluded that it would be possible to return an asteroid weighing approximately 500 metric tons to high lunar orbit where it would be mined for resources by 2025. The Asteroid Retrieval Feasibility Study, published on April 2, was prepared for KISS, NASA Jet Propulsion Laboratory, and the California Institute of Technology (Caltech). Co-leaders of the study included John Brophy of NASA JPL/Caltech, Fred Culick of Caltech, and Louis Friedman of The Planetary Society and participants included representatives of other NASA centers, various universities, institutes and private companies. And the First Lunar Celebritynaut is…. That looks that might be the case. According to NewsCore (who? ), “Avatar” and “Titanic” director James Cameron bought the first private trip around the moon. That’s the rumor, anyway. Space Adventures, which is setting up the trip aboard a modified Russian Soyuz transport, is neither confirming nor denying the story. The trip, would could take place as early as late 2015, is still awaiting the sale of a second $150 million ticket to another would-be lunar billionaut. Cameron’s participation makes sense. Space Adventures officials have said that the first ticket holder was a prominent personality who was going to do something very special on his lunar trip. A motion picture with Earth as a fragile oasis theme against the backdrop of space would be right up his alley. The other ticket holder may be one of the four men identified in Parabolic Arc’s recently completed poll at right. 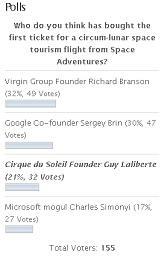 Virgin Galactic head honcho Richard Branson narrowly beat out Google co-founder Sergey Brin. The first clown in space, Guy Laliberte, was a distant third with two-time space traveler Charles Simonyi bringing up the rear. Thanks to everyone who voted! 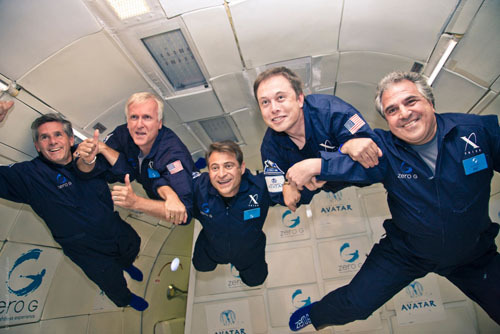 Please vote on our new survey on who you would like to send on a one-way trip to Mars! Vote early. Vote often. Just vote, dammit! NASA PR — The NASA rover to be launched to Mars this year will carry the Mast Camera (Mastcam) instrument already on the vehicle, providing the capability to meet the mission’s science goals. Work has stopped on an alternative version of the instrument, with a pair of zoom-lens cameras, which would have provided additional capabilities for improved three-dimensional video. The installed Mastcam on the Mars Science Laboratory mission’s Curiosity rover uses two fixed-focal-length cameras: a telephoto for one eye and wider angle for the other. 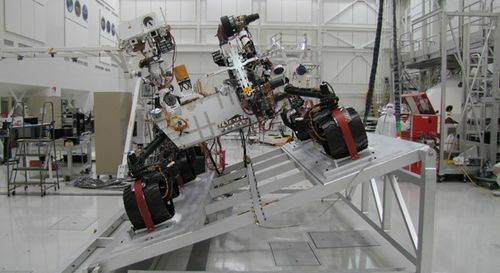 Malin Space Science Systems, San Diego, built the Mastcam and was funded by NASA last year to see whether a zoom version could be developed in time for testing on Curiosity. 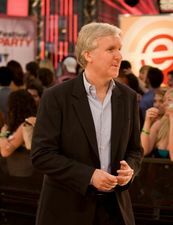 XPF PR — The X PRIZE Foundation today announced the appointment of James Cameron to its Board of Trustees. Cameron joins a world-class Board of Trustees that includes a growing list of entrepreneurs, scientists and engineers such as Dean Kamen, inventor, CEO, DEKA; Dr. J. Craig Venter, CEO, Synthetic Genomics; Elon Musk, CEO, Tesla and CEO, SpaceX; Ray Kurzweil, futurist and author; Anousheh Ansari, first female private space explorer; Larry Page, CEO & co-founder, Google; and Arianna Huffington, President and Editor in Chief, Huffington Post Media Group. The Board actively participates by advising on where large incentive competitions (X PRIZEs and X CHALLENGEs) can drive radical breakthroughs to help address humanity’s grand challenges. This special flight assembled a group of 30 individuals who are passionate about the science and technology represented in AVATAR and mission and innovation of the X PRIZE Foundation. Three spots were reserved for the winners of an eBay auction, in which the general public went head-to-head in a bidding war to snag a coveted seat aboard the once-in-a-lifetime opportunity. An additional 20 seats were sold for $15,000 each. The weightless experience took place aboard G-FORCE ONE, a specially modified, FAA-approved, Boeing 727-200 aircraft which departed from Van Nuys Airport. 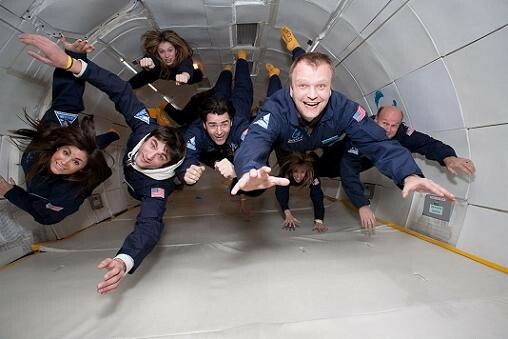 The flight, identical to those used by NASA to train its astronauts, provided guests the chance to fly like Superman and flip like an Olympic gymnast, as ZERO-G creates Martian (1/3-gravity), Lunar (1/6-gravity) and zero gravity conditions over the course of 15 parabolic arcs. Cameron, of course, is the director of “Avatar.” Elon Musk is founder of SpaceX and CEO of Tesla Motors. Craig Venter is a venture capitalist and biologist best known for his pioneering work in sequencing the human genome and creating the first cell with a synthetic genome earlier. And Jim Gianopulos is co-chairman-CEO of Fox Filmed Entertainment. Last month, X Prize auctioned off three seats aboard a ZERO-G microgravity flight with Cameron on eBay for $30,000 as a fundraiser. The bidders were anonymous, and Diamandis promised there would be “alot of amazing VIPs on this flight.â€ So, it’s not clear exactly who paid for the tickets. Two eBay auctions for seats aboard a microgravity flight with “Avatar” director James Cameron have raised $30,000 for the X PRIZE Foundation. By my best calculation, director James Cameron’s PSA for NASA is roughly 31 seconds of “Avatar” footage coupled with another 37 seconds of information about the space agency and its Earth Sciences program. I guess that’s not bad, actually.